Ground vehicle modeling and simulation. 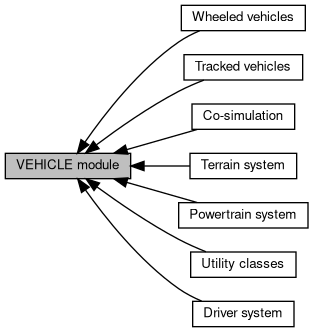 This module introduces template-based modeling tools for creating wheeled and tracked vehicles. Namespace with classes for the VEHICLE module. Enumerations for wheeled vehicle collision families. Enumerations for track collision flags. Vector of body state structures. Vector of wheel state structures. Vector of terrain conatct force structures. Set the path to the Chrono::Vehicle data directory (ATTENTION: not thread safe). Get the current path to the Chrono::Vehicle data directory (thread safe). Enum for guide pin (track shoe/roadwheel/idler). These flags can be bit-wise ORed and used as a mask. Enum for available powertrain model templates. Enum for available wheeled-vehicle steering model templates. Enum for available wheeled-vehicle suspension model templates. Enum for available tire models. Reissner 6-field shell element-based tire. Pacejka 89 (magic formula) tire. Enum for track shoe types. Enum for the side (left/right) of a vehicle. Get the complete path to the specified filename (thread safe). The filename is assumed to be given relative to the Chrono::Vehicle model data directory.